Eight hospitals, nine medical clinics and 14 ambulances have been bombed since Israel launched an offensive in the densely populated, narrow 40-kilometer-long coastal strip Gaza. Home to 1.8 million Palestinians, the U.K.'s Prime Minister David Cameron has called Gaza “an open-air prison”. According to Gaza's Ministry of Health, in the last 20 days four of the 1,000 killed were health professionals and 14 of the 6,000 injured were health professionals. Israeli military warplanes and tanks have also hit residential neighborhoods, schools and shelters. The U.N. estimates that more than 74 percent of those killed are civilians. Under the threat of bombs, doctors like Bassel Abuward, Belal, Saeed Kanafany, and Mads Gilbert are performing miracles at Gaza's largest hospital Al-Shifa. 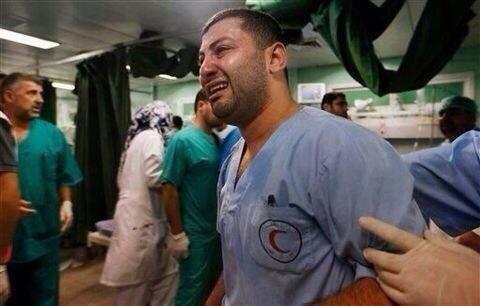 Doctors at the overcrowded Al-Shifa hospital are witnessing immense tragedy. Multiple people are being treated on the same bed in emergency rooms. High-risk newborn infants are dying because of lack of specialized care. 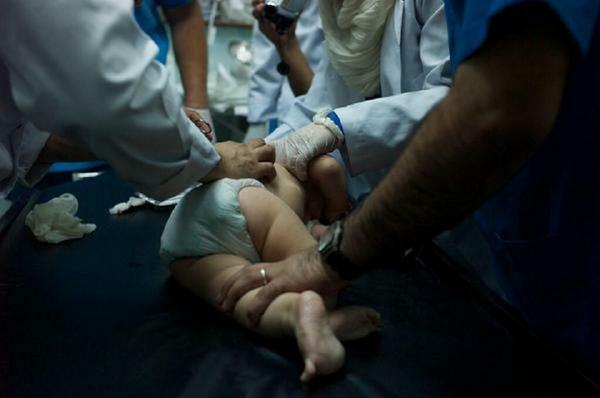 The doctors aren't just saving lives they are also telling the scale of the tragedy in Gaza to the world, by tweeting in between shifts about stories from the emergency rooms and the sights of destruction they see shuttling in between work and their homes. Dr. Bassel Abuward has been tweeting photos from the hospitals, devastation around Gaza and retweeting messages of solidarity and support around the world. Dr. Saeed Kanafy has been tweeting about the tragedies and realities medical professionals have been enduring. The U.S. gives Israel about $3.1 billion in military assistance every year. Each time the Israeli military launches a destructive and lethal offensive in Gaza — this is the third one in six years — the UNRWA, a U.S.-funded humanitarian agency, deals with the aftermath.